As Selections Committee chair for our Sacramento Angels investor group, I review applications from dozens of startup entrepreneurs looking for investment. I also mentor at our local university, and guest-lecture at a number of Entrepreneurship courses on how to pitch to investors, so the task of helping students and entrepreneurs visualize the process of investor decision-making has often been a challenge. When I first read about the Investment Readiness Level (IRL) on Steve’s blog, I was excited by Steve’s attempt to bridge the capital-efficient Lean Startup process for founders with the capital-raising process for funders. But the ‘ah-hah!’ moment for me was the realization that I could apply the IRL framework to dramatically improve the guidance and mentorship I was providing to startup company founders . Prior to having the Investment Readiness Level framework, this “how to get ready for an investor” discussion had been a “soft” conceptual discussion. The Investment Readiness Level makes the stages of development for the business very tangible. Achieving company milestones associated with the next level on the Investment Readiness Level framework is directly relevant to the capital-raising process. 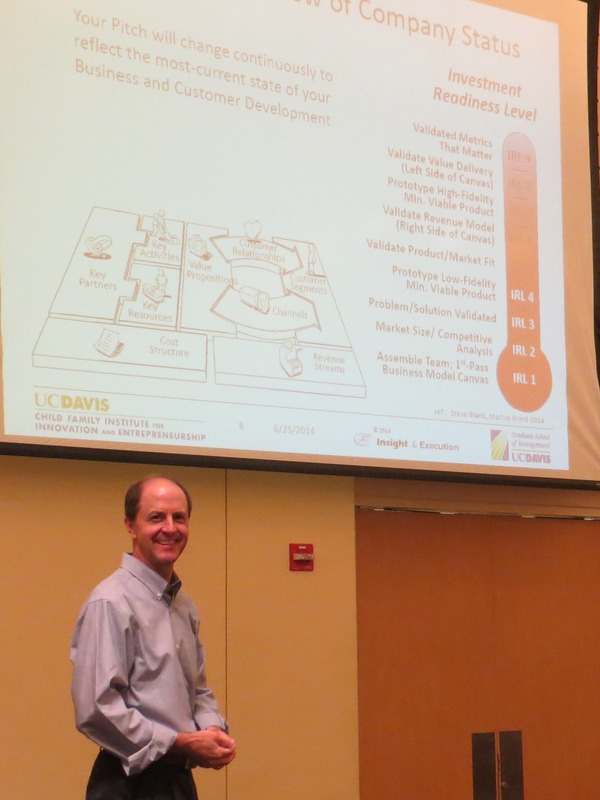 I use the Investment Readiness Level as part of my sessions to help the students understand that being ready for investment means that besides having a pretty PowerPoint, they need to do real work and show Customer Development progress. Ties the Lean methodology (and capital efficiency) directly to the capital-raising process – closing the loop and tying these two processes together. Is Prescriptive – offers founders a “what-you-need-to-do-next” framework to reach a higher level of readiness. Enables better mentoring. The IRL provides a vocabulary and framework for shifting the conversation between investors and entrepreneurs from simply “No”, to the much-more-helpful “Not yet – but here’s what you can do…”. The premise of the Lean Startup is that a startup’s initial vision is really just a series of untested hypotheses, and that the Customer Development process is a systematic approach to ‘getting out of the building’ and testing and validating each of those hypotheses to discover a repeatable, scalable business model. 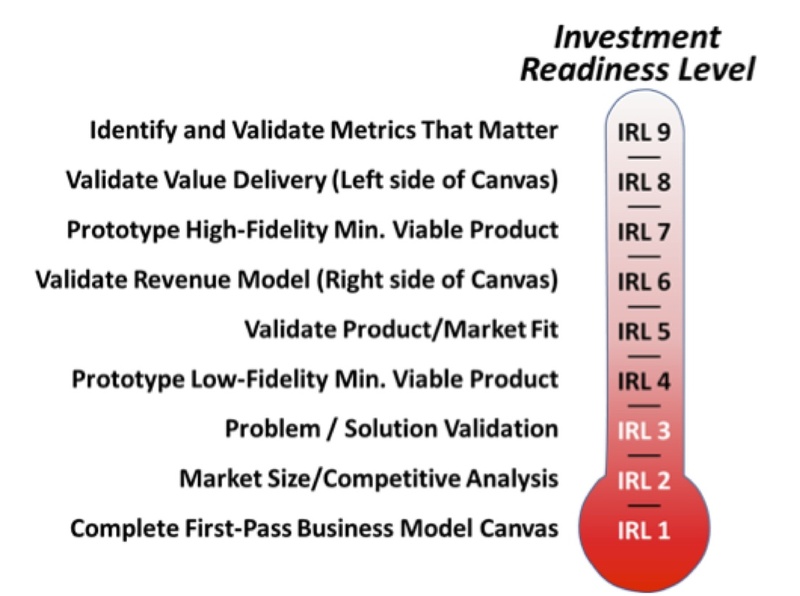 The Investment Readiness Level adds to this methodology by tying each phase of this discovery process or ‘hypothesis-validation’ to milestones representing a startup’s increasing readiness for investor support and capital investment. For investors this is a big idea. I remind entrepreneurs that investors are implicitly seeking evidence of progress and milestones (but until the Investment Readiness Level never knew how to ask for it). Entrepreneurs should always communicate their business’ very latest stage of customer development as part of their investor presentation. Given that a startup is continually learning weekly, the entrepreneur’s investor presentation will evolve on a weekly basis as well, reflecting their latest progress. In our Angel investor group, our Applicant Selections process ranks applicant companies relative to the other applicants. In the past, the ranking process relied on our Selection Committee members having an intuitive “feel” for whether a startup was worth considering for investment. As part of our screening process, I’ve embraced the Investment Readiness Level (IRL)framework as a more-precise way to think through where applicant companies would rank. (BTW, this does not mean that the IRL framework has been embraced by rest of our Selections committee – organizational adoption is a lot more complicated than an individual adopting a framework.) I believe the IRL framework offers a more-precise method to discuss and describe ‘maturity’, and will likely become a more explicit part of our selections discussion in the year ahead. At first blush the Investment Readiness Level framework is a diagnostic tool – it can be used to gauge how far a business has progressed in its Customer Development process. A supposition is that startups that have validated hypotheses about key elements of their business have reduced the risks in launching their new business and are more ready for investment. But the IRL is more than a diagnostic. It enables a much richer investor -> founder dialog about exactly what milestones a startup has actually achieved, and ties that discussion to the stages of the business’ Customer Development and business development progress. In the same way that Osterwalder’s Business Model Canvas provides a common vocabulary and enables a rich discussion and understanding of exactly what comprises the business’ design and business model, the IRL provides a common set of metrics and enables a rich discussion and understanding of just where the startup is in the maturity of its processes. This means the IRL is also a Prescriptive tool. No matter where a startup is in its stage of development, the immediate next stage milestone – where the entrepreneurs should focus their attention next – is immediately clear. Although every business is unique, and every business model emerges and evolves in its own unique way, the logical sequencing of incremental discovery and validation implicit in the IRL framework is very clear. No ambiguity. Clarity is good. The Investment Readiness Level adds a new dimension to those conversations, providing a vocabulary and framework for shifting the conversation from simply ‘No,’ to the much-more-helpful “Not yet – but here’s what you can do. …” It has completely changed the nature of the conversations I have with applicants. The prescriptive nature of the IRL means that wherever a business is in its current state of development, the next step on the ladder is nearly always pretty obvious. Of course, there should always be a little latitude for the unique nature of each business, but the IRL framework is a good guidepost. So the “here’s what you can do…” recommendations are clear, logical, and situationally-relevant to the entrepreneur’s business. I would estimate that perhaps half of the applicants we see have heard of and use some form of Lean Startup or Customer Development methodology. The idea of a “Minimum Viable Product” is something that has entered the general vernacular, but I’m sure that not all of the businesses tossing the term around truly understand the Lean Startup teachings. So when I’m providing feedback to an entrepreneur applying to our group for funding, I leverage the IRL framework to guide the feedback that I give. I don’t refer to the framework explicitly, but I provide feedback based on where I assess the company to be in their development, and what steps they’d need to pursue to get another rung or two up the ladder. I’ve almost universally found that the entrepreneurs I’m discussing these recommendations with are pleased to have the feedback, even if they’re disappointed that we may not be funding them. For an entrepreneur, receiving guidance of “Not now, but here’s what you can do…” is better than getting a flat, directionless “No.” For me, the ability to articulate the concept of maturity, and investment readiness as a continuum, is extremely helpful. Being able to articulate that an applicant’s current stage of development, along that continuum, is not aligned with our group’s investment goals but that with further progress on their part, there may be alignment – this is a fundamentally superior message. The Investment Readiness Level has given me the tools to engage in a consultative, coaching and mentoring conversation that provides much more value to entrepreneurs, resulting in a much more-enjoyable conversation for all involved.